When snow hits the ground, it can only mean one thing: ‘Tis the season for hosting parties! Something about the mix of eggnog, cold weather, presents, and family members can combine to create an impossible party situation for many would-be hosts. Is there a way to placate the in-laws, put together diet-friendly snacks, and keep the kids entertained without blowing a gasket? We’ve got you covered with this handy hosting survival guide; print it out, stick it to the fridge, and prepare yourself: winter hosting is coming. 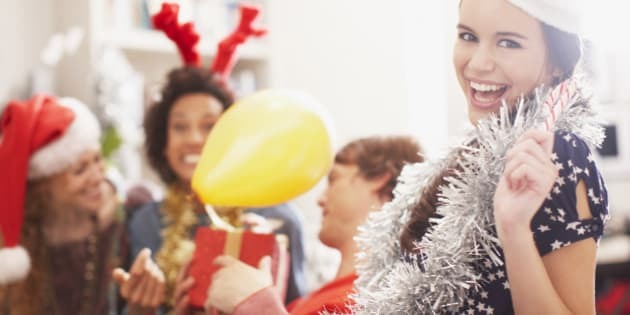 Unless your party is already themed around a specific holiday (Christmas and Halloween parties, for instance), try hosting a theme party instead of the standard meet-and-greet. Want to gather together for wine and cheese? Tasty! Want to have a marathon of every John Hughes movie? Amazing! Determining the theme du jour will also inform your guests of what sort of mood to expect. Specify beforehand if you want your guests to chip in. Let your guests know in advance if they will be expected to pitch in a nominal fee, or to bring along a food dish. Doing so can take some pressure off your back, and dishes coming from different people can create a good group atmosphere, as well as several conversation icebreakers. Create a place for safekeeping coats and bags. Never overlook this detail, no matter how minor it may seem! Hang coats on the wall or a closet and gather all bags in a secluded room. It will be neater and guests won’t have to swim around in a pile of personal belongings at the end of the night that you casually threw on the bed. Provide finger foods. If you are holding an evening party, expect that some people will eat before they come to party with you. Have a variety of different appetizers, like those made by Archer Farms (available only at Target), to meet the needs and desires of various guests. Set out a selection of macaroons, bacon-wrapped scallops, mini quiches, cheese bites, cinnamon rolls, and pecan tarts. Then, watch your delicious snacks magically vanish. It’s a holiday miracle! Have a few games going if the event calls for it. Whether it be video games, board games, or good old party games, having communal activities can bring out the fiery competition. Be good sports -- you don’t want to lose a friend at a party you throw, no matter how badly they were cheating at Monopoly (never trust the banker!). Stock your necessary toiletries. There’s nothing more embarrassing, as a party guest, as being trapped in your host’s bathroom with no more toilet paper in sight. Why risk needlessly embarrassing your guests? Stock the washroom with toilet paper, soap, towels, a spray, and maybe even floss if you’re feeling it. Have you ever tried maintaining a flowing conversation while loud music is blasting in the background? It’s a recipe for broken conversations and deafened guests. That’ll be your party if you turn your beats up to 11. Have a playlist going if you want, but keep the volume at an acceptable level where people can actually talk to each other. Don’t be the neighbour that earns a list of noise complaints by January. If your guests have visions of gum drops dancing in their heads, help them with their craving for sweets by laying out a selection of chocolates and candies. From peppermint M&Ms to some Archer Farms Belgian dark chocolate (available only at Target), your guests will never lack for holiday treats! This one is cliché, but relax! Hosting a party can be a fun experience, whether it’s your first time throwing a party or you’re an event planning guru on her third bridal shower. Focusing too much on minor details will stress you out. Why would you want to be stressed out at your own party?